Colorado has a long history in the wine industry. Grapevines were first planted in Colorado in the late 1800s. The industry was growing steadily until 1916. That was the year the Colorado General Assembly passed a state prohibition law. Things went from bad to worse. Even with the repeal of the 18th Amendment in 1933, it took until 1968 for Colorado’s first modern commercial winery to open in Denver, Ivanice Winery. Ivanice Winery initially used grapes bought from California to make wine. 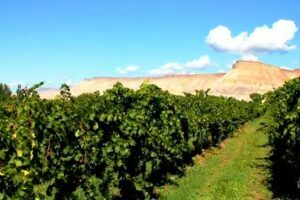 With time, founder Gerald Ivancie convinced growers in the Grand Valley around the towns of Grand Junction and Palisade to plant their own grape vines. Ivancie Winery closed their doors in 1974. They are looked back on as the catalyst behind the modern Colorado wine industry. In 1977, the Colorado General Assembly enacted the Colorado Limited Winery Act which created a special permit for small “farm wineries.” In 1990, with five wineries in operation, the General Assembly enacted the Colorado Wine Industry Development Act which created the Colorado Wine Industry Development Board (CWIDB). Colorado is currently home to over 100 unique, local wineries. Most of the vineyards are located in the Grand Valley AVA, with the West Elks AVA producing the next largest quantity of grapes. The Grand Valley AVA is best known for producing Bordeaux and Rhone Valley styled wines from Cabernet Franc, Petit Verdot, syrah and viognier are all varieties that perform well in the Grand Valley. Though the Grand Valley has a shorter growing season than other preeminent wine regions, the high altitude and clear skies allow for warm summer growing conditions, a large diurnal temperature difference and more growing degree days than Napa Valley or Bordeaux. The best terroir in the Grand Valley AVA is located at the eastern end near the valley around Palisade where the mouth of the canyon is protected from the harsh temperatures by the winds that blow from the canyon. The soils in the Grand Valley range from clay loam to gravely loam with sandstone and shale formed on alluvial terraces along the Colorado River. Canyon Wind Cellars, located in this prime real estate, pays homage to the importance of these vine-saving winds. The valley slopes downward as you leave DeBeque Canyon and cold air, the region’s biggest adversary, pools up in the lower elevations to the west. In fact, a severe cold spell in December 2009 killed almost half of the state’s grapevines to the ground. Luckily, most of the vines are grown on their own roots and did not have to be regrafted. Less than an hour’s drive southeast of the Grand Valley AVA is the West Elks AVA. This valley high in the mountains is not as productive as the Grand Valley, but the dozen or so wineries located here are starting to produce some lovely Alsatian-style wines. Riesling and gewürztraminer are the main grapes, but the quality of the pinot noir is catching up. Some producers are also experimenting with French-American hybrids that are better acclimated to the harsh winter temperatures that can creep into the early spring or late fall. The terroir in the West Elks appellation consists of deep, well-drained alluvial soils. Surrounded by snow-capped mountains, this region is perhaps one of the most beautiful in all of the United States. While not an AVA, a few wineries and growers call the Four Corners area (around the city of Cortez and Mesa Verde National Park) home. Despite its relatively small production, one winery in the Four Corners (Guy Drew Vineyards) received national attention when Gary Vaynerchuk was at a loss for words when he tasted Guy Drew’s 2007 Metate on Episode 26 of the Daily Grape. The region is still experimenting with cultivars, but Guy Drew Vineyards and Sutcliffe Vineyards both make excellent Rhône-style blends and varietal Riesling. The Front Range (in and around the Denver metropolitan area) has seen an explosion of wineries the past ten years. So much, in fact, there are now more wineries east of the continental divide than west of it. The wineries along the Front Range either own vineyards to the west or buy grapes from growers there. There are a few growers around Denver and along the eastern plains starting to grow hybrids, but so far few wineries are producing wine from them. The draw of the Front Range to wineries is the customer base. It is much easier to sell local wine to the large population base versus the small towns and cities on the western slope. Wineries like The Infinite Monkey Theorem (TIMT) in Denver have been making the most of their urban digs by making connections with restaurant sommeliers and retail wine buyers that the mom and pop operations on the western slope hadn’t been able to crack. TIMT is on more restaurant wine lists than any other Centennial state winery. It doesn’t hurt that sommeliers and chefs are eager to help winemaker Ben Parsons crush grapes, rack barrels and bottle and can wine (yes, TIMT puts a sparkling black muscat into 250 mL cans). The Colorado wine industry is still finding its identity, but the overall quality is increasing rapidly. The past three years have seen a Colorado winery awarded a Jefferson Cup by Doug Frost, MS, MW. Colorado wines put in blind tastings with top-flight Napa and Bordeaux wines have often held their own. Don’t be surprised when you see Colorado wines appearing on wine lists across the country, and deservedly so. So if you see a Colorado wine in a store or on a list, give it a try. It just might surprise you. This is a good article about Colorado’s Limited Wineries. You and other writers covering the history of wineries in Colorado have forgotten to or didn’t want to mention some of the key legislators in the Colorado General Assembly that were great friends of the Wine industry, myself included. Limited Wineries in Colorado have been a piece of work in progress since the early ’70’s clear up throught 2012. Thank you for the nice words Tilman! Nice article, Kyle! It’s a shame you haven’t tried any of our estate farmed wines, as we would love to be included in your writings. Please contact me at your leisure to schedule a time that we can meet and try the wines! Keep up the good work. Jim, glad you enjoyed the article. I would love to taste John’s wines; I haven’t had many opportunities to in the past. You can reach me at coloradowinepress(at)gmail(dot)com to set something up. Kyle… Thank you for the well written article on Colorado Wines. Note to self, I need to try some wines from Colorado! ThiS is a great shot at the brief history of the modern winemaking history of CO! Jay… Glad you liked the article. Kyle did a good job with his overview on the region.